What better image for baby shower invitations or to announce a baby is on the way than to show off the ultrasound pictures! It is essentially an early picture of the baby to be! I used a ultrasound photo and some decorative paper to create these unique ultrasound baby shower invites. With a few paper crafting tools, some decorative paper, and a little creativity you can create some really cute baby shower invitations for that special mom-to-be's upcoming party! For the base of this card I purchased some plain white blank cards. I used a rubber stamp I had on hand to punch the wording details into the inside of the invitation. The stamp has the "For:, Date:, Where:, etc.." wording and I just filled in the details by hand with a caligraphy pen. 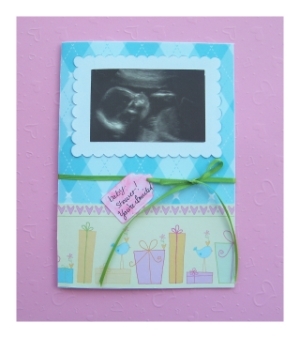 To start the front of this card you will need two coordinating colored decorative papers, and a solid color of cardstock paper to create the frame around the ultrasound photo. To add the ultrasound to the front of the invitations, I simply xerox copied it several times reduced to a smaller size to fit. First cut the background paper for the top half of the card. I actually cut mine to fit the entire front of the card. My cards were sized 5" by 7". The paper for the bottom half should match the width of the card you are using (5" in my case) by about 2" - 2 1/2" inches tall. I used a permanent glue runner to attch both pieces to the front of the card. Next I created the frame fro the front of the invitations. I used my Cricut Expression to create mine. But you can easily also just use a craft knife and a pair of paper edgers with a scallop shape. To do this simply cut out a rectangle with your paper trimmer. On the back of the rectangle using a ruler and pencil make a line about 1/8" in around all four edges. Use these lines as a guidline for cutting straight with your paper edgers. Next use the ruler and pencil to create a rectangle in the center of the scallop edge square and cut it out with your craft knife.Viola! You have made a little frame for the ultrasound picture to go inside of. To place the ultrasound phto inside of the little paper frame, I used some quick drying adhesive to attach it from the back. I then used a glue runner to apply some adhesive to the entire back of the frame and photo. I placed it onto the front of the baby shower invitations, making sure to center it as best as possible. To make the small tag piece for the front of the card I also used my Cricut to cut out the tag shape from some plain wite card stock. You could also use a paper punch, or go with a different shape like a heart or circle. Just punch a small hole into it with a 1/8" paper punch to thread the ribbon through. 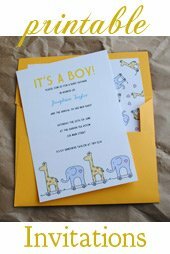 To add the baby shower wording you could use a rubber stamp, or do what I did and simply hand write it on with a nice caligraphy pen. Once the tags were finished I thread them onto the ribbon. To place the ribbons on the card I started by cutting many short lengths of ribbon for each invitation to make. I used a quick dry adhesive to attach the ribbon to the card front, only about halfway across the card so that the ribbon would fall just past the middle to the right of the invitation. I threaded the tags on and tied the ribbon into bows. To finish I trimmed the ends off of the bows so that they would hang equally. I trimmed the ends at an angle to give them a more finished look. * Instead of an ultrasound photo how aboout replacing that picture with one of the mother-to-be's baby belly?! * Use baby shower confetti on the front of the card instead of paper punch hearts to make these baby shower invitations.